Office Cleaning Services By Kanklean! Kanklean has specially trained commercial teams ready to take care of your work environment. Our cleaners are equipped to look after all kinds of areas and working environments whether they are large or small. We understand, as business owners, the importance of clean and fresh surroundings for all employees. All of our Office Cleaning Services teams are experienced, efficient and versatile with your cleaning requests. Our cleaning hours can be arranged at any time, day or night, any day of the week. There are no surcharges for weekends. With over twenty years of experience, we service a range of locations from offices through to builders cleans. No job is too tough. A clean and attractive office can reflect positively on your company, but you probably don’t have the time to clean your offices properly. Kanklean Office Cleaning services can do the cleaning for you, letting you focus on running your business. You can rest easy knowing your offices are being cleaned by trained and insured cleaning personnel who have the experience and integrity to handle your commercial cleaning needs with efficiency and discretion. Every one of our employees is experienced at office and commercial cleaning at all levels, ensuring that your offices will be thoroughly cleaned to your satisfaction every time. 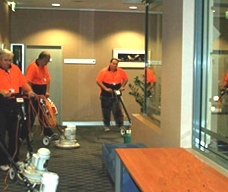 Our commercial cleaning Melbourne team come to you with all of our cleaning solutions and equipment. Please call to organize a quote for your clean with our friendly call centre staff! Kanklean Cleaning offers a complete selection of cleaning packages and schedules to fit any business’ size and schedules. Our professional or office cleaning services staff can work after hours for minimal interference with your daily operation, or we can clean your offices during normal business hours. We’ll work quietly and efficiently in the background without interfering with your employees or distracting them. You can be confident that our cleaning teams understand the need for discretion and are capable of working independently without the need for supervision. If you opt for cleaning during normal business operations, Our Cleaning Professionals will be neat, clean and appropriately dressed at all times. Kanklean Cleaning offers a variety of schedules for your Office. Cleaning that meets your high standards is always our focus; we look forward to devising a cleaning schedule that works around your business’ office hours. Whether you need routine weekly cleaning by our Commercial Cleaning team or have an immediate need for awning cleaning or window washing, we have a cleaning team to meet your needs. This is the Kanklean office cleaning service that’s ideal for larger offices that require frequent cleaning due to heavy traffic flow, exposure to the elements, or the type of products and equipment used. This is a money saving option for offices that may not need daily cleaning, but who want something more frequent than a weekly office clean in order to maintain that fresh, just cleaned look every day. This is a great Kanklean office cleaning services option if you would like some help staying on top of the heavy cleaning, but aren’t ready to commit to a weekly schedule. If your employees need to keep their areas clean but don’t always have the time to do a heavy, deep cleaning, our monthly Kanklean cleaning service is a great solution. This is a practical option for any business that needs daily Kanklean office cleaning services but is only open 5 days a week. Work with our trusted Cleaning staff to find the days that work best for your business. This is ideal for smaller businesses and companies and offices where heavy traffic, exposure to the elements, dust and debris, or the use of heavy equipment isn’t a problem. We have the ideal Kanklean cleaning solution for smaller budgets. Quarterly cleaning is Kanklean’s Commercial Cleaning version of seasonal cleaning. It includes routine as well as heavy cleaning four times a year to wipe away the grime and give your employees the incentive they need to maintain their office space for the rest of the year.